Project obstacles and solutions: Hoosier Energy operates a coal powered electrical generating plant at Merom Station, Indiana. 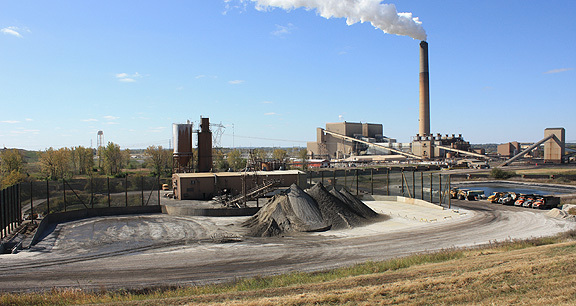 The Environmental Protection Agency (EPA) regulates the storage and removal of fly ash, a waste product of burned coal. Sterling Boiler and Mechanical was hired to build a new containment pad that would serve as a holding area for processed fly ash. At capacity production, the Merom Station plant produces 150 tons of fly ash per hour. This is then mixed with gypsum and lime to stabilize it. Hoosier Energy needed the concrete in the pad to be large enough to contain all of the processed fly ash, be strong enough for heavy equipment to roll over, and to keep storm water from penetrating the slab and leaching into the ground. Sterling Boiler worked with IMI to supply concrete that would meet the requirements of the project. IMI produced a 5,000 psi concrete mix that used a high range water reducer. This allowed for a lower water-to-cement ratio, one of the keys to decreasing permeability in concrete. It produces a smoother finish with tighter pores. The project also included a three-sided wall that was the base for a large wind screen. This was put in place to eliminate any fugitive dust at the site. IMI delivered 2,500 yard of concrete for the footings, walls and pad of this project. In 2016, this project was awarded an Outstanding Concrete Achievement Award from the Indiana Ready Mix Concrete Association for infrastructure - energy construction. For more information on high strength, low permeability concrete, contact the IMI sales representative for your area. Click here.